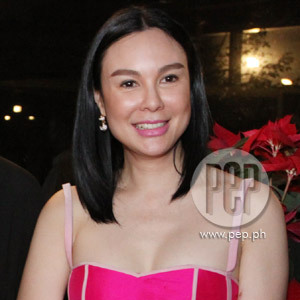 Gretchen Barretto (in photo), KC Concepcion and Angelica Panganiban will topbill Alta, ABS-CBN’s upcoming primetime series depicting the lives of people who come from different social classes. ABS-CBN’s upcoming TV series titled Alta aims to show the contrasting worlds of the masses and high society. Gretchen Barretto, KC Concepcion and Angelica Panganiban have been chosen to depict the colorful lives of people who come from different social classes. "Magte-tape kami right after Holy Week. Tantsiya namin, ilalabas ito the same time na nilabas namin ang Magkaribal. Around June, lalabas ang Alta, ang title ng aming bagong teleserye," Gretchen told Showbiz News Ngayon during the 9th Gawad Tanglaw awards night held at the St. Dominic College of Asia in Bacoor, Cavite. This will mark her return to primetime television after starring in the fashion-serye Magkaribal last year. Alta will be directed by Nuel Naval, the same director who megged Magkaribal and the Maalaala Mo Kaya episode, "Larawan.". This MMK episode earned for La Greta the Gawad Tanglaw award for Best Performance by an Actress (Single Performance). Meanwhile, this project will also mark the return of KC to teleserye acting after starring in the Filipino version of Lovers in Paris. She has been busy hosting various shows such as Simply KC and Star Circle Quest for the Next Kiddie Superstars. Last March 12, KC portrayed the life story of Star Power winner Angeline Quinto for Maalaala Mo Kaya. For her part, Angelica was last seen as the lead actress of Rubi, the local adaptation of the Mexicanovela of the same title.